A newly-uncovered patent has given some insight in what to expect from Samsung's long-awaited Bixby smart speaker. Set to go head-to-head with the Amazon Echo and the Apple HomePod devices, Samsung looks to be taking a slightly different approach to its smart offering, if the patent dated November of 2017 is anything to go by. But that's not all. 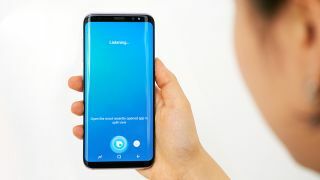 Equipped with a camera, the potential Bixby speaker described in the patent can also recognise user faces, again helping to pinpoint a voice and, presumably, eventually making it easier to identify individual family members and tailor requests appropriately. The speaker would also feature either an LED, LCD or OLED display with touch functionality, which could be used to display messages and images. With LTE, Wi-Fi, Bluetooth, NFC and GPS onboard, as well as USB and HDMI, it appears it'd be able to receive media files too, ready to be outputted to another external display source. Samsung has teased a smart speaker release for the second half of 2018, but this is the most we've heard about the device since MWC early this year. If the patent is suggestive of the final device, Samsung looks to be putting together a much richer proposition than its competition. The best smart speakers: which is worth talking to?